I found this week quite hard, as it was up to each of us to choose a photo! It was much more difficult than I thought it would be. Isn’t it funny how we can get thrown by simple things – like having too much choice?? So if you’re following along at home here is my photo for Week 10 of our 52 week photography project, with the theme Photographer’s Choice. When I questioned the theme of Photographer’s choice, while being away from home for the week, my sister’s advice was take a photo of something I wouldn’t find at home. So obviously I chose Mt Warning as my model! The iconic cane fields provide a natural frame to this special place. 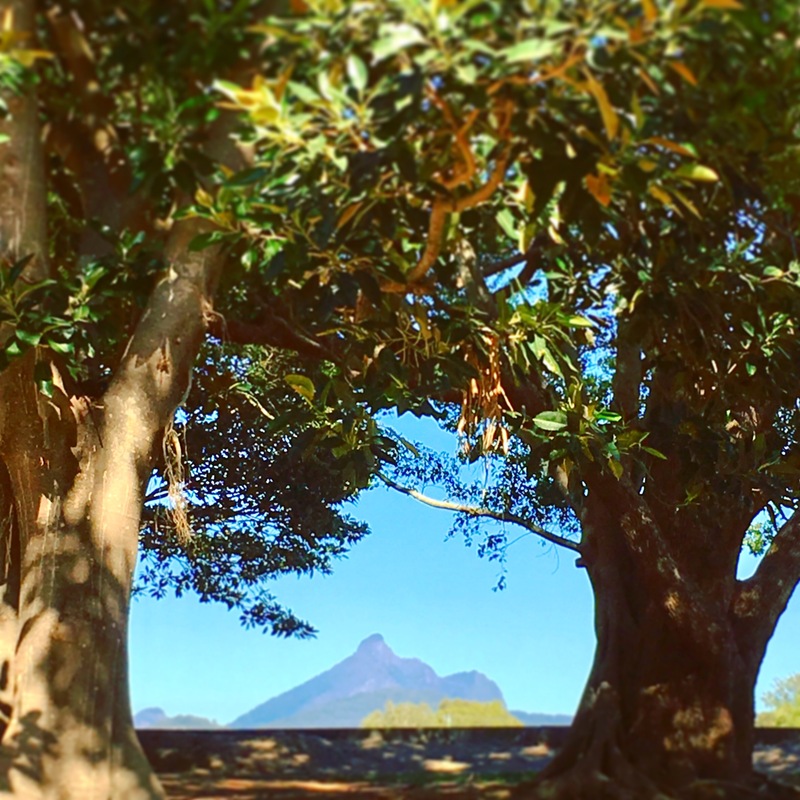 I also took this photo of Mt Warning, as framed by some lovely old trees, and had a terrible time choosing which one to use! In the end I went with the cane fields as they are an icon in the area. Which one would you have chosen to use? This week’s photos were another great mix of everyone’s personalities. You’ll have to click the link to go and check them all out. I often think the comments accompanying the photos are the best part and this week was no exception. Do you have any comments to make? That’s a big mountain! Great work with the camera :). Thanks very much, I always try to get a different angle when I’m up that way, so I was pleased to get these shots. Yes it is a big mountain, and quite a hard climb to the top. Both great shots. The Mountain is an interesting shape. Yes it as a real hook doesn’t it? It is very majestic and stands out for miles. Beautiful pics and a great project idea! I can’t wait to see what else comes out of this. Thanks Tony, it’s fun and keeps the creative juices flowing. Awesome initiative! I know someone who did a 100 daily photos challenge. They’re great to boost creative thinking:) Your photos are amazing! Thanks for the idea, I might look into doing something similar sometime. I really like this idea. I have seen people that have done a 30 day photo challenge as well. It’s a great way to keep the creative juices flowing. It is good to think outside the box and you are right it keeps the creative juices flowing. Love the idea of a photo a week group. I also enjoyed both of your photo of Mt Warning. Nice pictures! I also love how you guys made it into a family project! Great way to have fun and spend quality time together! Yes Claire, it’s ended up being a nice family group and although we are scattered all over the world it brings us together each week. Thanks. Thanks for your positive comment on my photos, I too love the line of Mt Warning. As to joining in, it’s a small, closed group and not taking new members just at the moment. You are more than welcome to follow along though!! Sometimes when choices are thrown at you, there’s either too much to choose from.. or too little to think of. You did a great job, and have taken up quite a challenge here. Love your photography. Cheers! !